What do you think of when I say illness? Perhaps you think of the common cold, maybe you’ve heard your grandparents talk about how their gout is acting up, or maybe you know somebody with a chronic illness like diabetes or Crohn’s disease. Thanks to modern technology and medicine we’re curing more diseases and saving more lives than ever before. Antibiotics, Chemo-therapy, vaccines, surgery, X-Rays, the list of lifesaving implements goes on and on. Despite these amazing advances, there is one disease that has spread like an epidemic across America even though we know exactly how to treat it, obesity. The National Center for Health Statistics reported that in 2015-2016 year almost 40% of adults in the U.S. were affected by obesity. That is over 93 million people! Even more disturbing is that a similar trend is found among the youth of today. The same NHCS report shows that about 18.5%, or about 13.7 million children in America today are affected by obesity, and the numbers are only rising. Something needs to be done. Before we go about discussing how to fight obesity, lets clarify what it is and how it endangers those it affects. Obesity is basically just an extreme version of being overweight, that is, having excessive amounts of fat deposits on your body. So what is the dividing line between being just fat and being obese? The Center for Disease Control and Prevention, or CDC for short, describes obesity as having a Body Mass Index of 30 or higher, that is being in the 95th percentile for your weight. BMI is measured by taking your weight in kilograms and dividing it by the square of your height in meters. Unfortunately, BMI is not the most accurate measuring system as it is based on the average person and doesn’t account for your specific body type, but it is close enough to get a rough idea of whether someone is obese or not and it is the easiest way to measure large numbers of people across the country. So what does it mean for the poor soul who gets labeled obese? After all, if so many people have it, it can’t be that bad right? This couldn’t be farther from the truth. The Journal of Clinical Endocrinology and Metabolism published a report in 2004 on the effects of obesity named “Medical Consequences of Obesity”. The results were clear. The increased number of fat cells accumulating on the body had far reaching and diverse negative effects. The sheer weight of excess fat can effect the victim in multiple ways. Breathing can be hampered during the night causing sleep apnea and the joints of the body wear out far faster than normal, causing osteoarthritis, especially in the knees. Obesity also effects the endocrine and cardiovascular system. Type 2 Diabetes is so common in the obese that it almost a guarantee, and the risks of heart disease (the number 1 cause of death in the U.S.) along with hardening of the arteries are greatly increased due to the increased workload placed on the heart. The problems don’t end there either. The social stigma of being overweight has caused many obese persons to develop a number of mental abnormalities with women being more susceptible to them than men due to the pressure for women to be “skinny”. These include depression, anxiety, and a lack of social interaction in general. The problems don’t end there. The increased number of obesity related health problems means that healthcare spending is greatly increased for the obese. Health Affairs issued a study in 2009 that estimated that the medical care cost for obesity related problems in 2008 was 147 million dollars. That is over $1400 higher than those of normal weight. This is not the only financial problem faced by the obese. A study done by the Harvard School of Public Health indicated that the money lost due to “obesity related absenteeism” totaled to somewhere between 3.38 and 6.38 million dollars. This means that they make less money from work and spend more money on medical care. This is bad for them and the economy. With the upward trend in obesity it means fewer people will be working and, more people will be on disability taking money from the system and not putting anything back in. As you can see, obesity is a much larger problem than people realize (no pun intended). It affects physical and mental health, the economy, and even national security. The great irony of this situation is that the answers and solutions to obesity and weight gain are well known and really quite simple. A balanced diet filled with healthy foods and plenty of physical activity. The problem is that the American lifestyle and diet contains none of these things. With advances in technology many people, especially kids, have become more sedentary than ever. Computers and machines have taken over many of the physically demanding jobs of the past and videogames and TV’s have replaced playing outside. If that’s not bad enough, the restaurants and fast food joints of today sell some of the least nutritious food imaginable in quantities that far surpass the average Americans caloric need. Take soda for example. 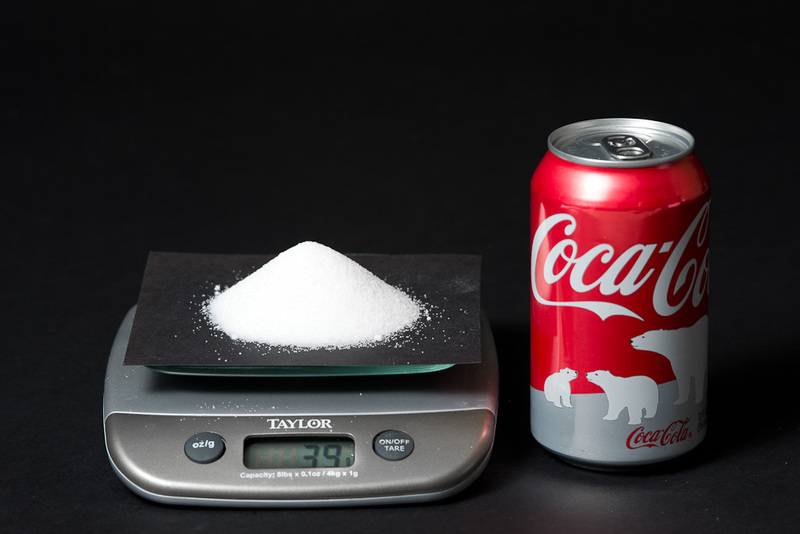 In the average 12oz can of Coca-Cola there is 39 grams of sugar. That is more than the recommended daily sugar intake by the American Heart Association for an adult male. 12 ounces is often just the smallest size as well, for just a few cents more you can double the volume and sugar with it. This is where I think we should begin our treatment of diabetes. Limiting fast food chains on the sizes and quantities of their products can help to limit the amount of calories people are consuming at one sitting. You can buy fries in a 1/2 pound bag at Bakers for goodness sake! Is that really necessary? Next, I would make food stamps and other food assistance programs available for use with healthier options and limit the number of sugar laden products. A study done by researchers from the Johns Hopkins Blomberg School of Public Health in 2007 found that even though obesity has increased across all ethnic and socioeconomic groups, with those from minority and low socioeconomic status groups being disproportionately affected. By increasing the availability that these groups have healthy foods you can help them get on track to a healthier lifestyle. These are just a few things that could help to stem the tide. To really impact obesity in America , however, you need a large scale, multi faceted approach to the problem. The first step is education. If we don’t educate people and more importantly kids on the dangers of obesity, they will find out the sad reality of it far too late. If we can teach the kids of today to be healthy, they will become the healthy adults of tomorrow, teaching their kids to do the same. This is why I think it is important to focus on teaching children the importance of health and fitness. Anyone who has been on a diet can tell you how incredibly difficult it is, especially if you have to lose a large amount of weight. If you don’t have any weight to lose in the first place though, this entire situation is negated. For adults that are obese, the answer is simple. Diet, exercise, and possibly surgery are the only way, but for children who don’t yet know what the far reaching results of their choices will be, we have one chance to make a positive impact. By limiting time spent in front of electronic devices to 60 minutes a day and encouraging them to play outside or even inside with toys helps them to get exercise and work their minds instead of just absorbing info from a box. Also, include fruit and vegetables with every meal, and whenever possible. Limit the consumption of sugary drinks and replace them with low fat milk or water. Staying healthy is not complicated, but it is difficult. This is why I recommend tackling this problem as a family. This adds accountability and will strengthen your resolve to stick with it. Just as it is important to be a good role model for your kids in regards to work ethic and the treatment of others, so to is it true for healthy habits. If they see you fighting every day to make the right choices with food and exercise, they will be more likely to follow suit. It won’t be easy, but I guarantee it will be worth it. This article describes the various consequences being obese has on the human body. It goes into detail on the link between diabetes, heart disease, and assorted endocrine problems that are brought on or exacerbated by obesity. I plan on using this to confirm that obesity is a definite problem and needs to be solved. The gentlemen who wrote the article is an M.D. and someone whom I would think is well informed on the matters of health and obesity. This article the often ignored financial and economic consequences of obesity. It goes into detail on how much individuals are losing as well how much is spent on obesity related healthcare annually. I will use this to show another of the dangers related to obesity. Harvard Medical school is one of the best in the world so I imagine they are a reliable source. This article shares many obesity related facts and studies from prevention and treatment to cost analysis. I will use this source to quote many statistics and studies showing the dangers of obesity. The CDC is a well recognized government organization that has an entire division dedicated to the study, prevention, and treatment of obesity and it’s related health risks. This is study that was used to discern the prevalence of obesity among Americans of all ages and ethnic groups. This is useful for showing how widespread obesity has become. I have seen the CDC and multiple other agencies and researchers use NHCS data to study obesity across multiple years. This page shows the dangers and effects of sugar along with basic sugar nutritional data like recommended limits and what not. I will use this to show the prevalence of sugar in todays American diet and more specifically the recommended amount of daily sugar. The American Heart Association is a collection of some of the top physicians and researchers that have banded together to inform and help cure heart related diseases. This TEDx talk describes how the issue of obesity is becoming a nation al security threat. I will use this to show the far reaching and diverse consequences obesity has on our country. General Mark Hertling was the Commander of Initial Training for the Army and as such is well informed on the status of recruits going through his programs. This article describes the various costs both personal and national among the obese. These vary from lost time at work to illness and other health related issues. I will use this to show how obesity affects not just your health, but your finances and the economy as well. Health Affairs is a multidisciplinary and peer reviewed journal that researches various health related policies and issues. This is Coca-Cola’s actual product website. I am using this to make a point at how much sugar Americans are consuming without even realizing it. As this is Coca-Cola’s actual website I’m fairly certain the facts are accurate. I did some looking around and found the same amount of sugar given from different websites as well.